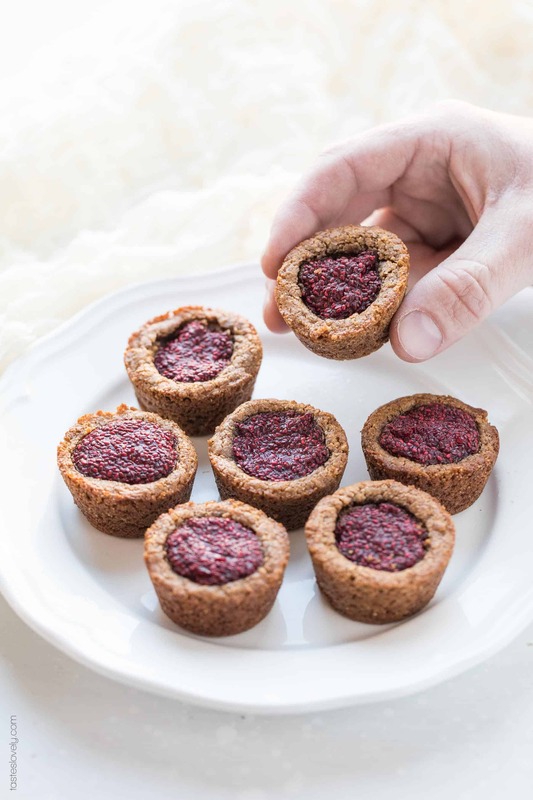 Paleo Almond Butter and Chia Jam Cookie Cups – a gluten free, grain free, dairy free, refined sugar free clean eating cookie recipe. So healthy, you could have these for breakfast! 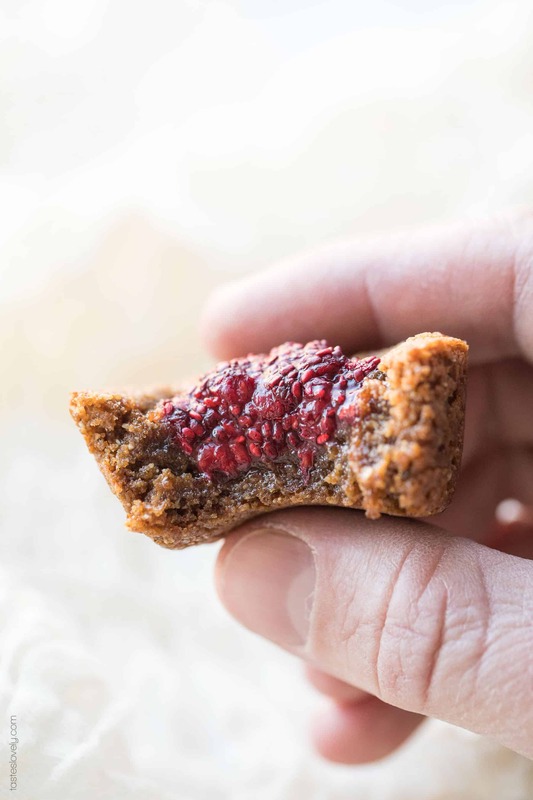 I have got a new spin on my extremely paleo almond butter cookies popular for ya! These ones have a delicious filling of jam. Because what is more classic than almond butter and jam? Remember that delicious paleo chia seed jam I shared last week? After having it I knew it would be the perfect addition to my almond butter cookies. I actually first scooped it on top of my regular baked paleo almond butter cookies. So good! I thought they would be even better baked right inside. I was right! It is my exact same almond butter cookie dough. 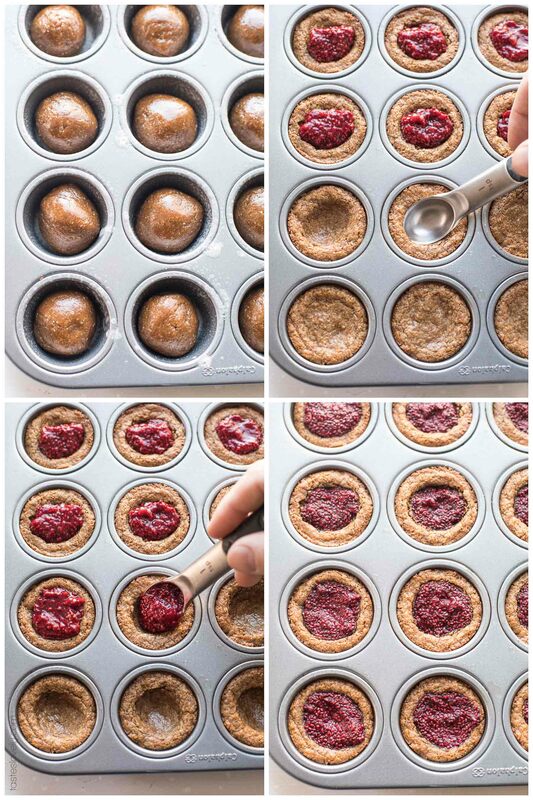 You just use a cookie scoop and scoop them in to a mini muffin pan and par bake them. Then you remove the cookies, make a small indentation in the middle, fill it with the chia seed jam, and finish baking in the oven. 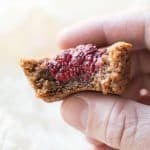 It makes the most delicious paleo almond butter and jam cookies! They have crispy edges, and a slightly gooey center with a sweet jam filling. 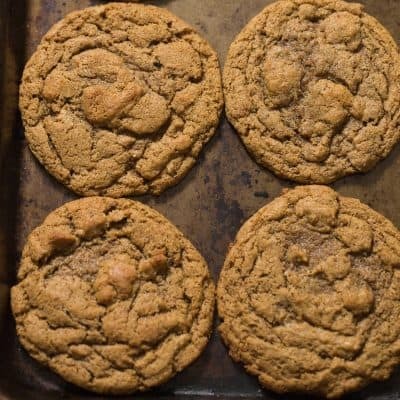 And just like my original paleo almond butter cookies, this cookies are best after they’ve completely cooled. When they’re warm out of the oven they’re not very strong, and fall apart easily. But when completely cool they’re the perfect cookie! I wait at least an hour. The wait is agony, but worth it. 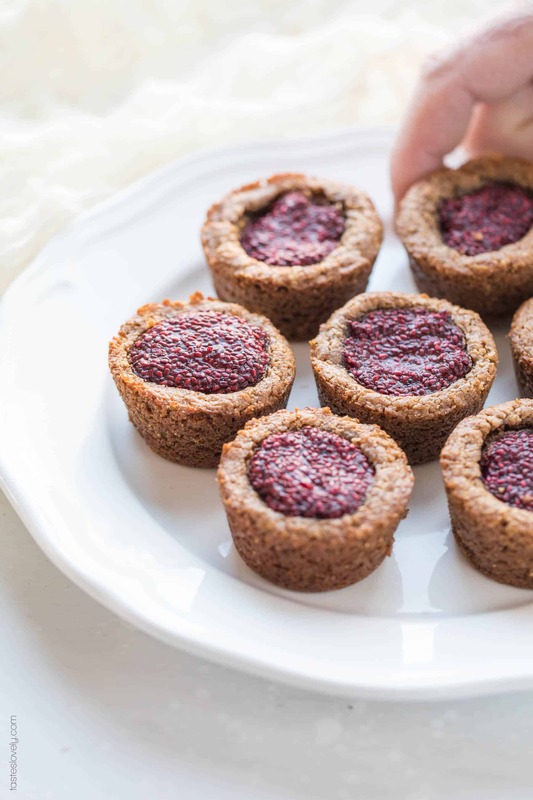 I made these with a raspberry paleo chia seed jam, but any berry would do! These are oh so healthy, you could even eat them for breakfast! I’ll give my 2 year old a cookie after he finishes his eggs. He is in heaven because he is eating a cookie, and I’m happy because he’s getting so much extra protein. Win win! Such a delicious paleo, gluten free, grain free, dairy free, refined sugar free, clean eating cookie recipe. Preheat oven to 350º. Spray the mini muffin pan with coconut oil spray. In a medium size mixing bowl, combine the almond butter, coconut sugar, egg, baking powder and vanilla. Stir to combine. Use a medium size cookie scoop (or measure out 1.5 tablespoons) to make round balls of dough and place in the mini muffin pan. Will make about 21 cookies. Bake for 8 minutes. 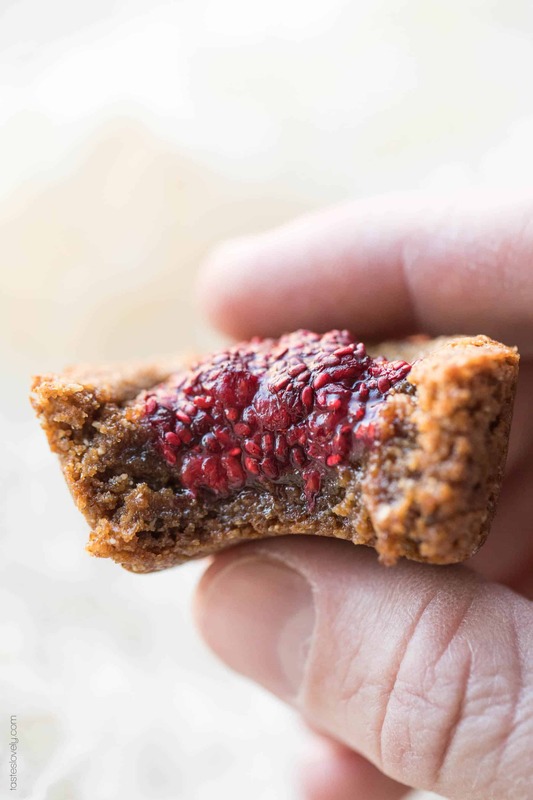 Then remove from the oven and use the back of a teaspoon measuring spoon to make an indentation in the cookies, and then fill them with 1 teaspoon of the chia seed jam. Return to the oven and bake for another 6-8 minutes, until the edges are golden brown. Remove from the oven and allow to cool completely in the muffin pan. At least an hour. 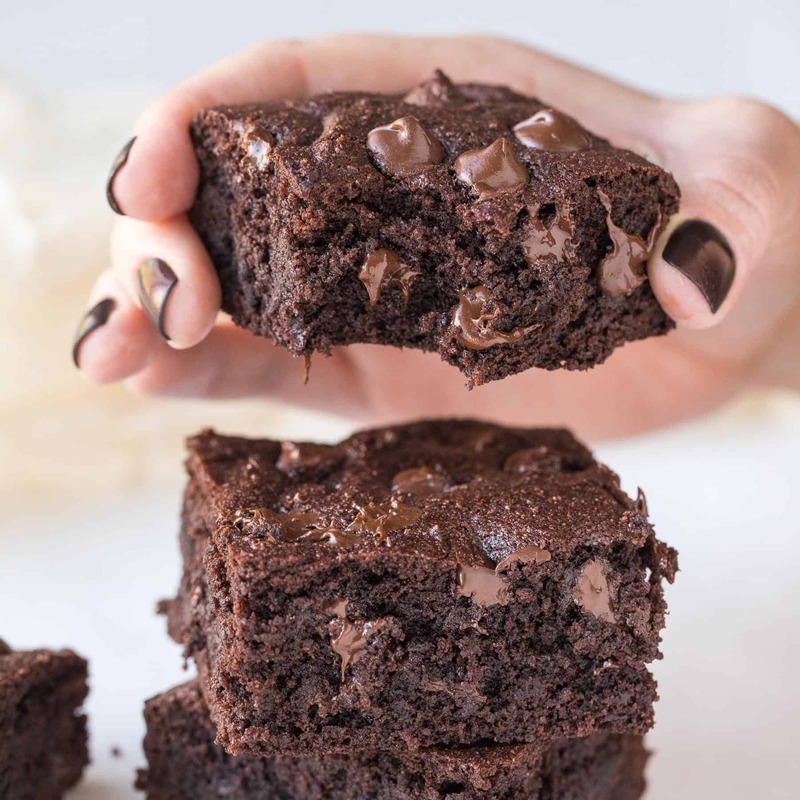 When these are warm they break easily, but once cooled to room temperature they’re perfect. Run a knife around the edges to loosen and turn out on a baking sheet. 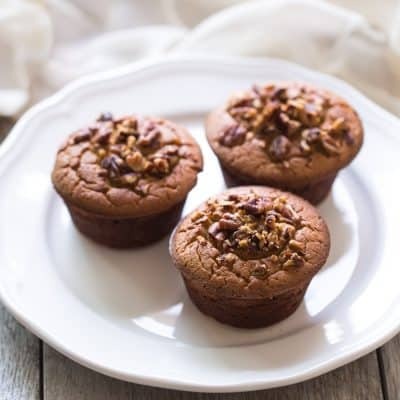 You can use mini muffin cups to line the muffin pan if you tend to have bad luck loosening baked goods from your muffin pan. I just have to let you know that I made your dairy free pesto for dinner tonight and OH MY GOODNESS! It’s truly amazing. I’ve been dairy free for almost a year and terribly miss pesto. It is better than the store bought brand and doesn’t need nutritional yeast! I can’t wait to try these yummy treats next! These are SOOOOOO good! My kids loved them! My 4 year old told me I make the best cookies ever. I love how healthy they are. Can’t wait for them to go to bed so I can sneak some more for myself.